The Sound of Vienna New Year s Concert has been the most favorite concert for our classical fans every year. This time, the 8th Sound of Vienna New Year s Concert is different from the past years. 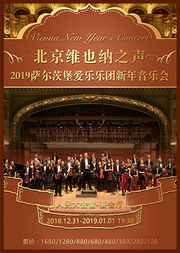 2019 New Year s Concert is more than a concert of classical music. Let s greet the new year with the marvelous music. It has won PREMIO ALLA CULTURA award in L Associazione I Gaudenziani Amici della Basilica di San Gaudenzio in Italy. cross-over projects (such as "Mozart goes Jazz" or "Maria Bill singing Edith Piaf") and for performing rarely played works such as Schmidt s "The Book With Seven Seals" or Bernstein s "Mass". "Every concert is a nirvana." is the theme of Salzburg Philharmonic Orchestra.